These words are inscribed in the altar below a picture of Christ hanging on the cross. He died for you and me so our sins are forgiven. This truth has been told by our forbearers as it is today. The first church was built on this site in 1877 as Our Savior's Lutheran Congregation which was eventually changed to West Moe after a province in Norway where many of the original church members came from. As the area became more populated, the congregation began splitting and formed 11 other congregations in the area. 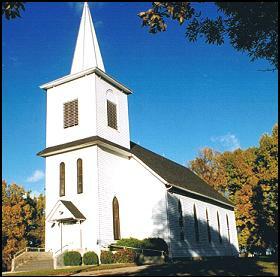 East Moe is one of these congregations. East and West Moe have always shared a pastor and share the parsonage. We continue to have two church buildings and operate as one parish. Our services are a combination of traditional and contemporary as we seek to bring Christ's gospel to people of all ages. In 2005, West Moe Lutheran is alive and well, serving the community with God's word. Please join us for worship and fellowship.